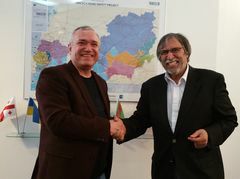 On 5 April 2015, at TRACECA Road Safety II project office, Kiev, Ukraine Mr. Mircea Ciopraga, Secretary General of the PS IGC TRACECA met with Dr Alan Ross, Team leader of TRACECA Road Safety II project. During the meeting Dr Alan Ross briefed Mr. Ciopraga about the results of the first phase of the project and the activities planned for the next 6 months. These activities have included amongst other actions the implementation of national road safety action planning workshops to start developing road safety action plans in each country. It has also included the agreement to establish 3 regional working groups to harmonize activities of traffic police, roads administrations and Ministries of transport across the region. “Up till now the primary focus has been on understanding the problems and needs of the individual countries and the region. We are now moving into the next phase where we will assist each country to implement improvements in their areas of need.” – said Dr Ross. Mr. Ciopraga underlined the importance of the project in delivering the road safety in TRACECA countries and expressed PS IGC TRACECA commitment to support the project efforts regarding the facilitation of effective cooperation with TRACECA beneficiary countries. The parties agreed to work closely and share the information in order to maximize the effectiveness of the assistance provided by the project.